A local environmental toxicologist said Harris County added more confusion rather than clarity to the shelter-in-place emergency order. 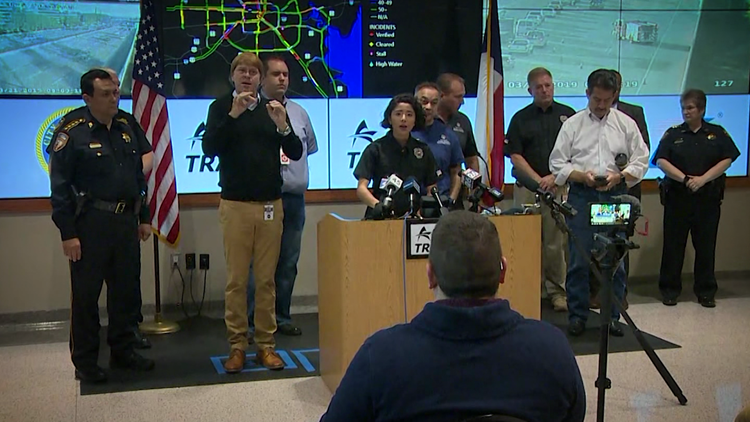 HOUSTON — In an effort to be transparent with data on its emergency management website, a local environmental toxicologist said Harris County added more confusion rather than clarity to the shelter-in-place emergency order Thursday morning. At a morning media briefing, Harris County Judge Lina Hidalgo, along with Dr. Umair Shah of Harris County Public Health, encouraged citizens to visit readyharris.org/deer-park-fire, the county’s emergency management website. Posted online is a map with current air quality monitoring measurements taken around the ITC chemical storage tank facility that burned for several days. Color-coded dots represent risk levels at respective locations. But according to Dr. Noreen Khan-Mayberry, chief toxicologist for NKM Environmental Health Sciences, the published data did more to confuse rather than accurately inform the public. Benzene is just one chemical in a general category of volatile organic compounds, or VOCs, and the threshold for dangerous levels are much different than the broader spectrum. But the public could not have interpreted Harris County’s online measurements because the published readings only included a number and “ppm” or parts per million. Missing was any mention of benzene. “You need something with specificity and publish the data,” Dr. Khan Mayberry said. KHOU 11 Investigates discovered another issue with the county data. Judge Hidalgo told the public the air quality readings online were updated “very much close to real time.” But when we recorded the website at 8:15 a.m. Thursday, nearly all of the measurements were from 7 or 8 hours earlier, or even the night before. “It doesn’t look like you’re being as forthcoming as you should be,” Dr. Khan-Mayberry said. “You can’t just say, 'It's safe. Trust us’. These days, trust but verify,” she said. Harris County later updated its air quality map to clearly indicate benzene levels at specific monitoring locations. By that time, those levels had dropped substantially, and the shelter-in-place order had been lifted. Harris County Public Health also later clarified the “real-time” data issue. Spokesperson Dee Marlow said while data in the field is sent back to the county in near-real time, there is a quality control process that takes place before that data is turned around and published online.